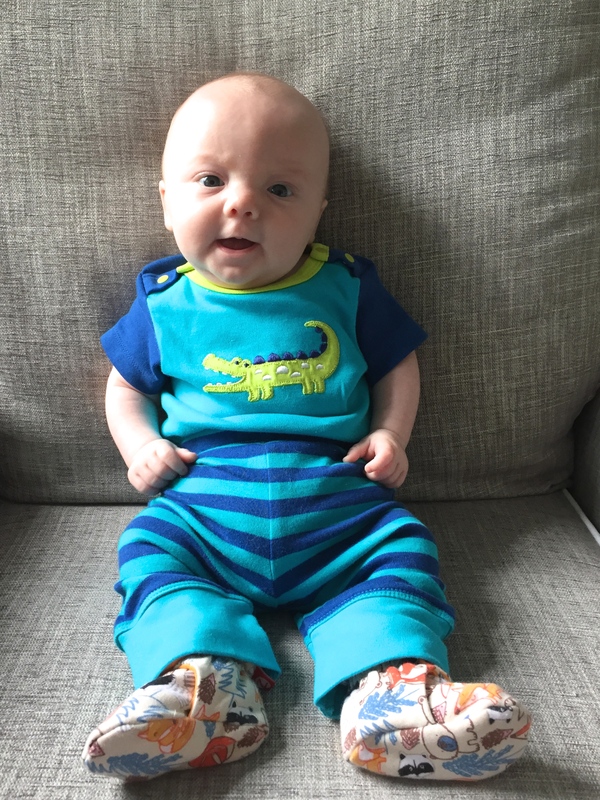 Happy two months, little man! I can’t believe how much has changed since my last post. In his second month, Miles has definitely woken up. He opens his eyes nice and wide, makes eye contact, and focuses on people and objects (and dogs!) around him. He’s also started to vocalize with the cutest “gahs” and “ayes” and we always babble those sounds right back to him. I can’t get enough! As you can see in the picture above, last week he started giving us some smiles, and…just …wow! Seeing those first smiles—real, unmistakable, on-purpose smiles—is the best thing in the world. It reminds me a lot of what it was like to feel him kick for the first time when I was pregnant. It’s hard to explain, but in both instances I suddenly felt so connected to this little life. We’ll do anything to make him smile no matter how ridiculous we may look. Robert and I feel incredibly lucky that Miles makes it pretty easy for us to be new parents. Like any baby, he has his moments of crying and fussiness, but overall he’s a calm and content little fella. Not only does he look like his dad, I’m pretty sure he has his easygoing demeanor, too. Sleep is a work in progress. In general, I’d say that he’s a pretty good sleeper for an 8-week-old. Currently, he goes to sleep between 8 and 9 p.m. and wakes up twice at night for feedings, which last 30 to 45 minutes each, and then goes down pretty easily after each one. When Miles was about 6.5 weeks old, we moved him out of our room and into his nursery. It was bittersweet, but a good decision for all of us. He makes so many noises at night that were keeping us up! At first he was sleeping in his rock n’ play in his room and he did really well with that. However, we know that he should be sleeping in his crib (which he’s never really liked) so we’ve been working on having him sleep in there at night and for some naps. We still swaddle him using either a Halo Sleepsack or Summer Infant Swaddleme. No matter how much or how little sleep I get at night, I always look forward to the morning. Morning Miles is my favorite! (Bathtime Miles is a close second.) Even if our day starts at 5:30 a.m., I’m totally okay with it because of how sweet he is. After Miles has been fed, he’s super alert and so fun to be around. 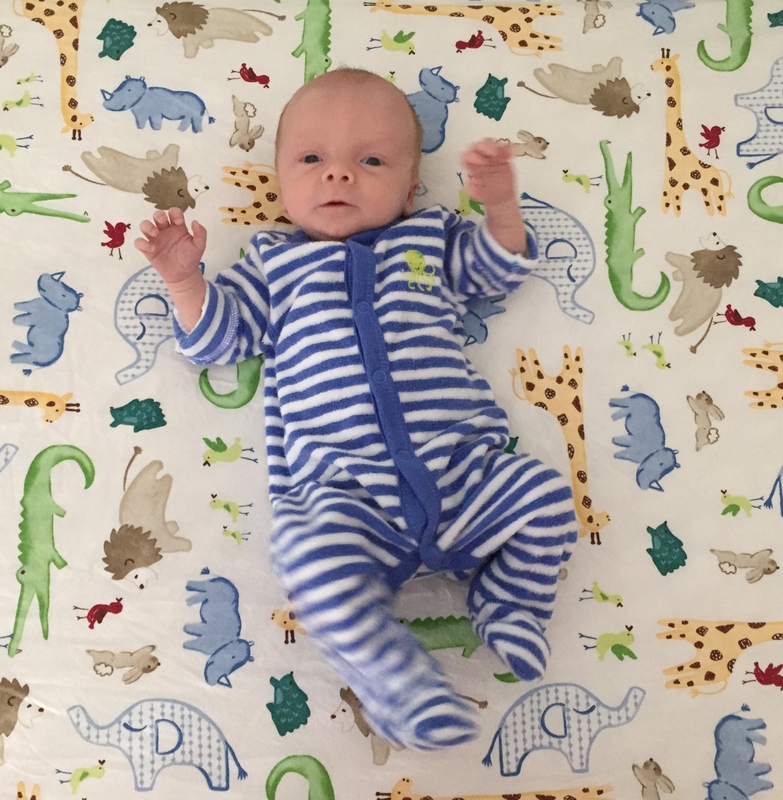 We’ll hang out in the jungle (aka his activity gym), do some tummy time, read some books in bed, make funny noises back and forth, and chill. Miles doesn’t even need to be entertained–he’s just happy and alert–but now that he’s awake for longer stretches, especially in the morning, I try to take advantage of that time when I can. This is probably a result of spending way too much time on social media and reading too many blogs, but I often see people lamenting the fact that their baby is growing up and getting bigger. Is it weird that I don’t feel sad about this? As much as I adore this newborn stage (and I really really love everything about it), I’m excited about everything that’s still to come! I can’t wait for giggles, babbling, playing, crawling, and on and on. I love that he’s getting bigger. I love that I’ve already packed away his preemie outfits and his newborn-sized clothes are next. I love that every day he discovers something new like the crocodile hanging from his activity gym or the lights in the kitchen ceiling. I love that as soon as I think I know him, he becomes someone new. For me, this is what it’s all about and I’m happily soaking it all in. In my last post I mentioned how much I love the Solly Baby wrap. Well, I’m convinced that babywearing is the key to a happy baby and happy parents, at least in this household! In addition to the Solly, we love our Lillebaby. 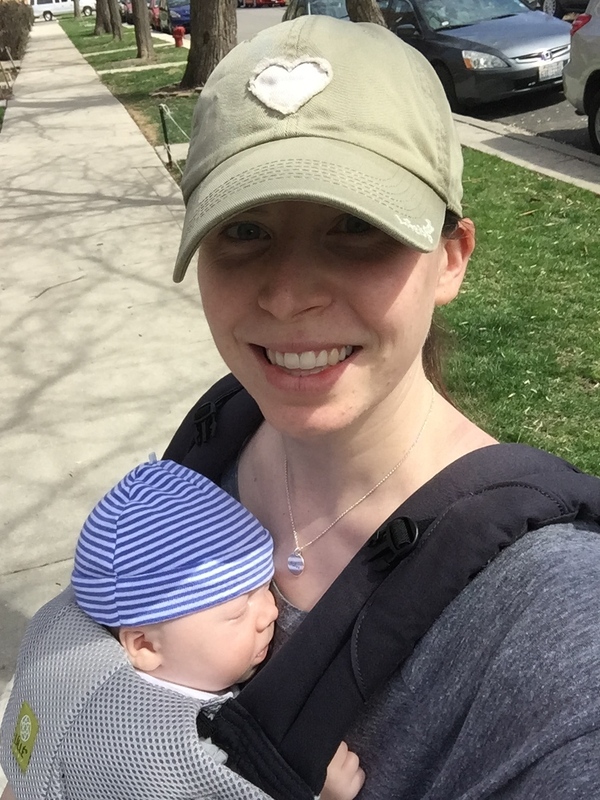 I love the close contact babywearing provides, while enabling me to have my hands free to do things such as walk the dogs, put together a meal, eat, fold laundry, answer e-mails, and more. It’s also a great alternative to using the stroller when running errands. Babywearing is pretty magical—as soon as I put Miles into one of the carriers, he snuggles close to me and falls asleep. Some evenings I’ll wrap the Solly on while he’s still napping or hanging out and as soon as he starts fussing I plop him in there and all is right in the world again. Looking ahead, this next month is a big one for us. Robert has one week left of his busy season and then he’ll be around a lot more. Woo hoo! In many ways it feels like a fresh start for us as parents. He’ll be taking a week of paternity leave in May and we planned a little getaway to Michigan for our first family trip, which should be really fun and, hopefully, relaxing. Finally, I wanted to end this post with something that’s been on my mind since Miles was born. I realize that it may seem like it’s all puppies and babies and rainbows and unicorns around here, and for the most part it is (well, minus the rainbows and unicorns). What follows, which is about feeding Miles, has consumed a lot of my thoughts and energy during these first few months. As we enter his third month, I think I’m finally starting to accept things as they are, focus on the positive, and let my disappointment go. I had every intention of breastfeeding Miles for at least the first year. Before he was born I did everything I could to set us up for success. I took classes, read books, researched, stocked up on everything I could possibly need, and more. It was really important to me to make it work. Unfortunately, that is not our reality. I just never produced anything. 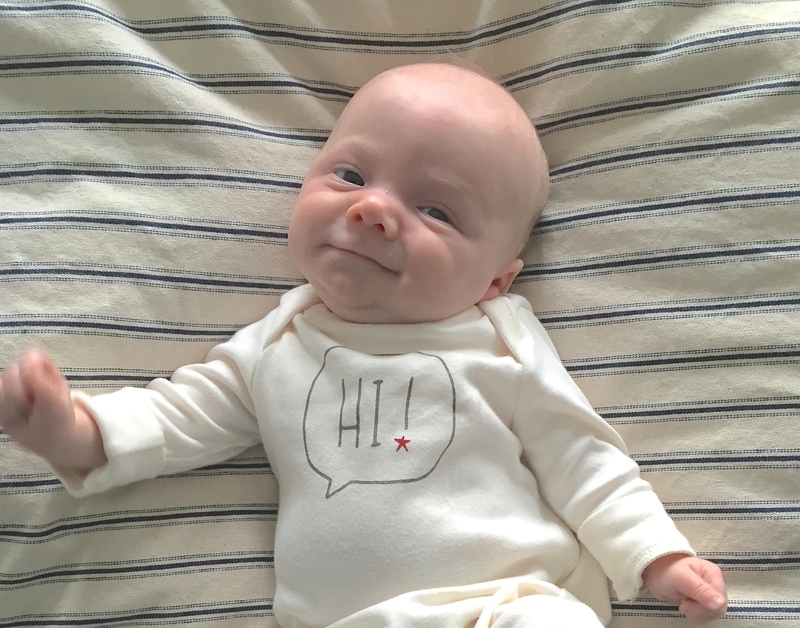 I worked with lactation consultants and tried everything imaginable, but still had nothing to give him. Finally, my doctor offered one more option: a medication to treat acid reflux that’s prescribed off-label to induce lactation. I considered it briefly. I wanted to know that I did everything possible to feed our baby and that certainly would’ve been everything. However, after careful thought and discussion, I decided that the side effects such as anxiety and depression were too risky (what new mom needs that?) and there wasn’t enough long-term evidence for me to feel certain that it was safe for Miles and me. I also felt that I didn’t want to force my body to do something that it clearly wasn’t doing on its own. And so, our reality is that our baby is formula fed. Accepting this reality has been the most difficult thing I’ve faced since he was born. I know that in the scheme of things feeding him formula isn’t that big of a deal. 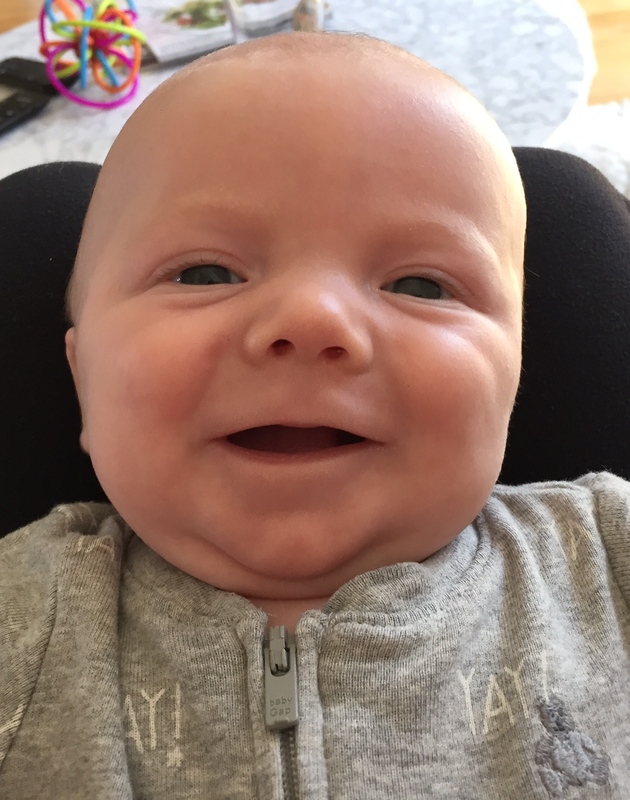 (Heck, I was formula fed and I seemed to turn out okay…) And of course, the most important thing is that he’s happy, healthy, growing, and loved. He’s certainly all of those things. It’s just that knowing all of the benefits of breastfeeding for mom and baby, I’m disappointed that we don’t get to experience them. Whenever I feel bummed about giving Miles a bottle I call to mind something my mom said that put it all into perspective for me. At his two week doctors appointment when we found out that he was over five pounds, which was a big milestone for us, I texted my mom the news followed by “no thanks to me.” Her response: “Babies also grow on love.” Isn’t that the truth? I may not be able to feed him in the way I had hoped, but I’ll always be able to nourish him with an endless supply of love. This entry was posted in Miles Atlas, Pregnancy & Baby on April 27, 2015 by Paige Greenfield. We officially have a one-month old! When I think about how much has changed from the day we brought Miles home until now, it’s hard to believe that it’s only been one month. But oh, what a month it has been! 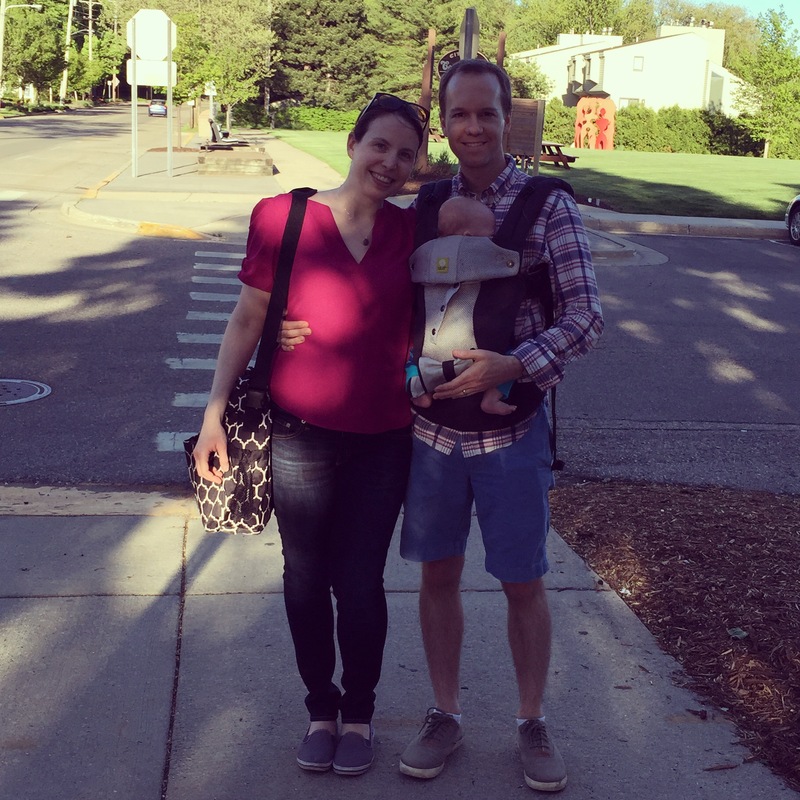 I’ve heard that the first three months (“the fourth trimester”) are all about survival: Just doing what you need to do to make it through each day and night. Honestly? That thought makes me sad. So even before Miles was born, I knew I wanted it to be different for us. I knew I wanted to be present; to soak in the happy moments and embrace the challenging moments with as much love and patience as I could possibly summon. And you know what? We’re doing much more than surviving over here. I’d even venture to say that we’re thriving! Miles has an incredibly sweet and calm demeanor. He’s still pretty sleepy, but has one or two very alert times each day–often in the morning and early evening. During those times, he’s perfectly content hanging out and quietly drinking in the world around him. I just sit back and watch him take it all in. I try to remind myself that there will be plenty of time for books, songs, toys, and more as the amount of time he spends awake during the day increases over the next few weeks and months. I imagine it’s typical of most newborns, but I feel grateful that when he cries it’s always for a reason that I just need to figure out and fix. He’s either hungry, needs a diaper change, needs to be burped, or wants to be held. At first it was all trial and error, but I’m getting better at anticipating which one it is. Thankfully, once I’ve solved the issue he stops crying immediately. I’m not yet able to distinguish one type of cry from another, but I’m sure I’ll get there eventually. 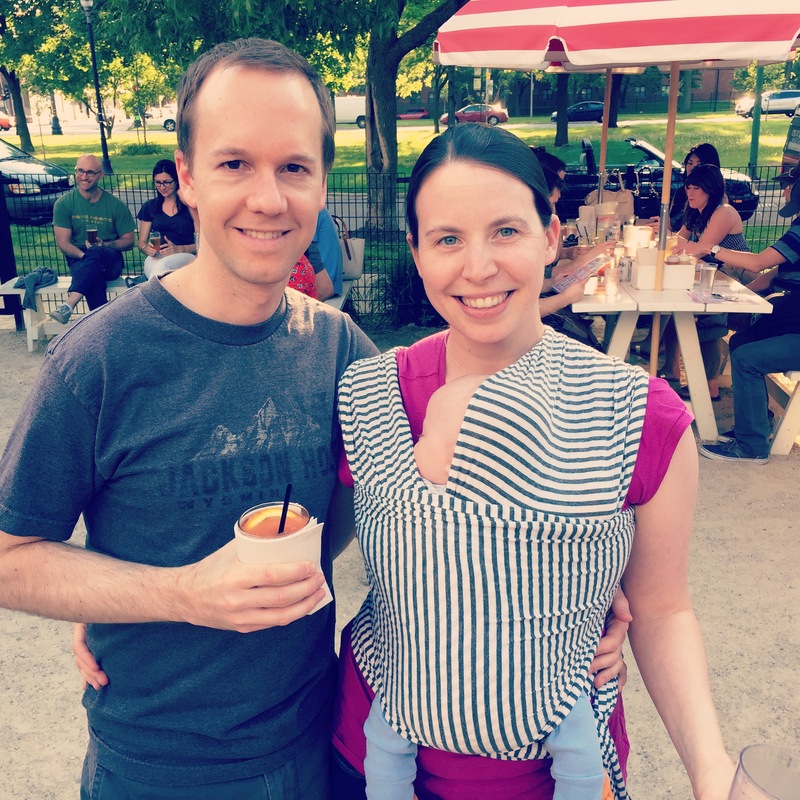 I also feel lucky that so far he loves being worn because I always hoped to do a lot of babywearing. My sister gave me a Solly Baby wrap for my shower and it’s one of my favorite baby items. I put Miles in it in the evening when he gets a little fussy and he almost always conks out. I’ve even eaten dinner with him in there. I love that sometimes all he needs in the world is me. What a feeling!!! I can’t wait to try out other carriers as he gets bigger and I know Robert is excited about wearing him, too. Our sweet boy is growing like a weed! 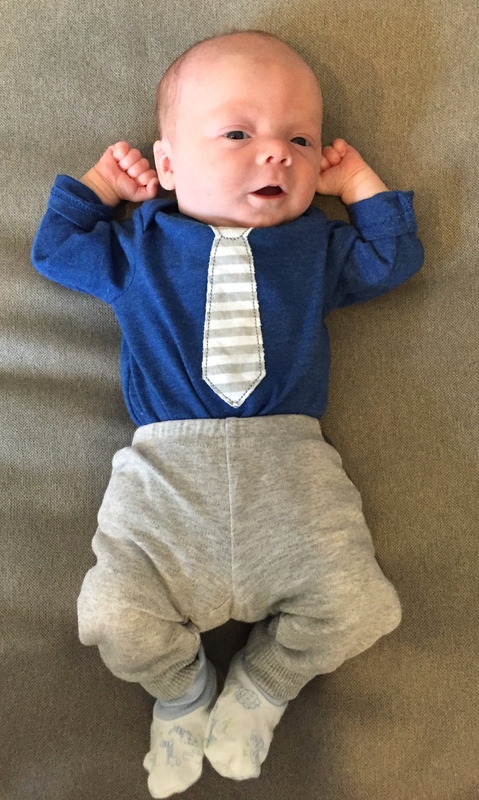 At first, all of his newborn clothes were giant on him. My sister sent us three preemie outfits, which were pretty much all he wore for the first 2.5 weeks. Then, all of a sudden, one day he couldn’t straighten his legs in them any longer and so it was onto his newborn clothes. 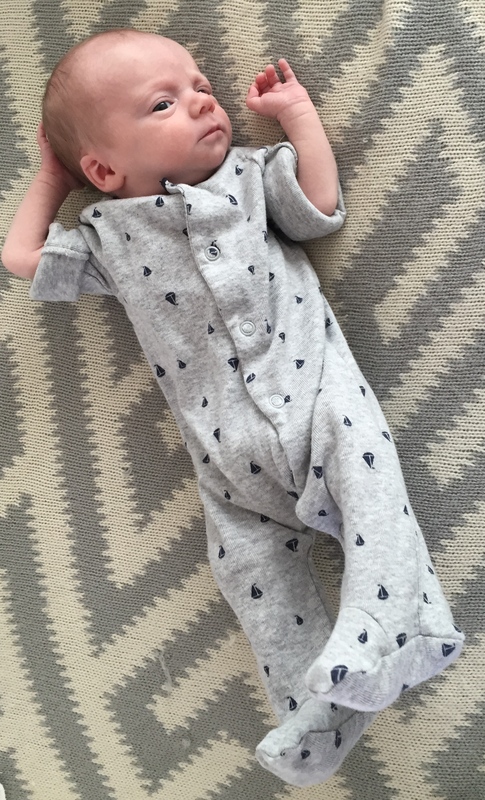 Now, some of the arms and legs of his newborn onesies seem like they’re getting a little short. I thought I’d feel some sadness over the loss of his newbornness as he got bigger and bigger, but, for the most part, I feel happy about it. Sure, looking back at photos where his entire bum fit into the palm of my hand (he was four days old in the photo below) makes my heart ache a little. But his biggest job in life right now is to grow and my biggest job is to make that happen so it’s incredibly fulfilling to watch it happen before our very own eyes. We have his one month doctors appointment today and I can’t wait to find out how much he weighs at four weeks old. Thriving though we may be, if I had to sum up our first month in one word it would be hard. The thing is, it’s been hard in ways I never imagined it would be. 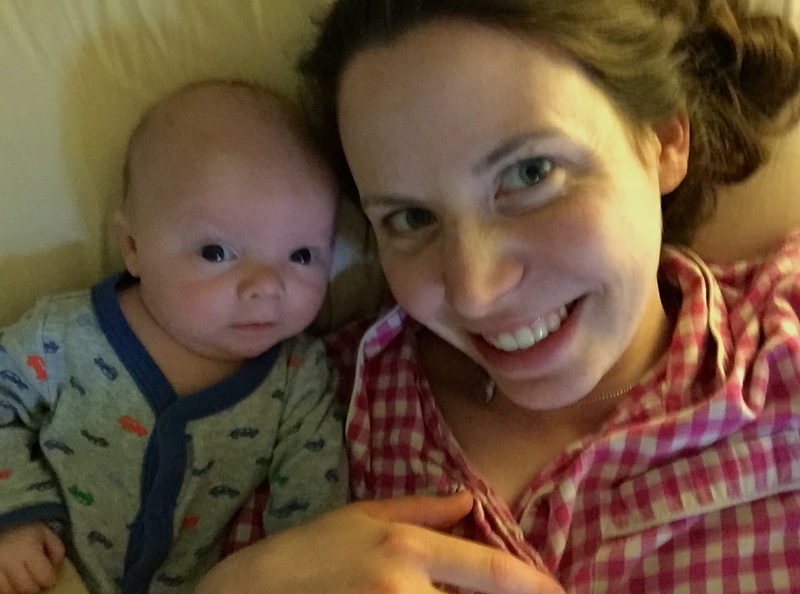 Before Miles came along, I assumed that the most challenging part about life with a newborn would be the lack of sleep. I hope I don’t jinx myself (I almost don’t want to type this…), but I’m actually getting a decent amount of sleep–about five to seven hours per night. It’s fragmented into two to three hour chunks at a time and is lighter than I’m used to (I’m totally that new mom who wakes up to make sure her baby is breathing), but I’ve been pretty functional on the amount of sleep I’ve been getting. I also try to get one nap each day, often in the late afternoon or early evening (more on that in a moment). We had every intention of putting Miles in his crib from day one, but he was so new and so tiny that I couldn’t do it. So he sleeps in a Pack ‘n Play Newborn Napper right by my bedside for now. 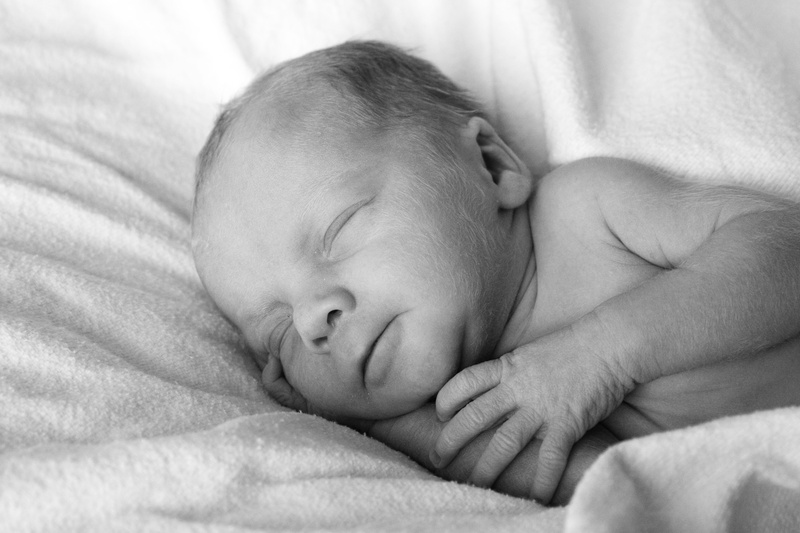 So what’s so hard about newbornhood? I think it’s the fact that it feels like I’m using every single brain cell every second of every day. I’m basically on all the time and in ways I never was before. Even while I’m folding laundry or writing this blog post while he naps, my mind is completely focused on Miles and anticipating his next need. At the end of the day I’m exhausted not because I didn’t get enough sleep, but because I’m mentally zapped. And it continues through the night and into the next day and so on. I imagine this will lessen over time (maybe?) as more of this stuff becomes second nature and doesn’t feel so new. However, I’m also aware that things change so much from one week to the next, so perhaps this state of being on is our new normal…or the essence of parenthood. What else I’ve found to be hard are the evening hours. While I thankfully haven’t experienced PPD or anything close to it, I get a little blue during the evenings from about 5pm until bedtime. I think a lot of it has to do with the fact that Miles was born during Robert’s busiest time at work (he’s a CPA), so it’s often me and the baby all day and all night long. By the early evening I’m ready to have another set of hands so I can do some of the activities I used to do that make me feel like me. I miss cooking a lot, but it’s just too challenging to attempt right now (I tried. I failed. I cried.) Thank goodness for all of those freezer meals! Fortunately, some nights Robert has been able to come home in time for our pre-bed routine, which has been super helpful. Then he puts in a few more hours of work from home–poor guy. Once I identified what was going on by about week 2, I found some things that help me get through those stretches. I’ll call my mom, run an errand with Miles, or take a nap with him on my chest (my new favorite thing in the entire world—it’s glorious!) I also know that it’ll get easier when Robert is around a lot more starting in May and we’ll find our new evening routine together as a family. Whenever things get challenging, something that really helps ease my mind is saying to myself “this is normal.” So whether it’s a wide awake baby in the middle of the night, fussiness, or feeling lonely in the evening, knowing that it’s all totally normal and that countless women have walked this path before me is reassurance that I’m totally capable of getting through it. In fact, that’s something that’s really surprised me during these early weeks: My ability to be a mom. 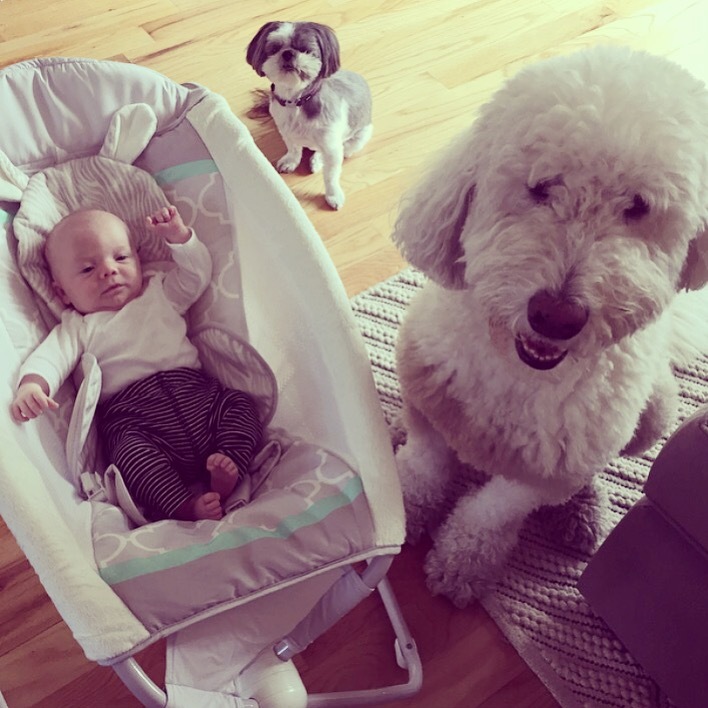 Before Miles came along, I had very little experience with newborns or babies. In the past, whenever I would hold a baby or play with one or care for it in any way, I always felt super awkward. I had no clue what I was doing. But for some reason, with Miles, I feel totally capable. Even if I’m doing something I’ve never done before, which is pretty much everything, I feel a sense of calmness and confidence. I probably don’t do everything exactly right, but I try to approach each new situation with common sense, safety, and love. So far it’s working out extraordinarily well. Ultimately, watching Miles grow and thrive, getting to know his little personality and witnessing it develop each day, and relishing in his newborn noises and snuggles make even the hardest parts of life with a newborn so, so worth it. I wouldn’t trade a moment of it for anything in the world. 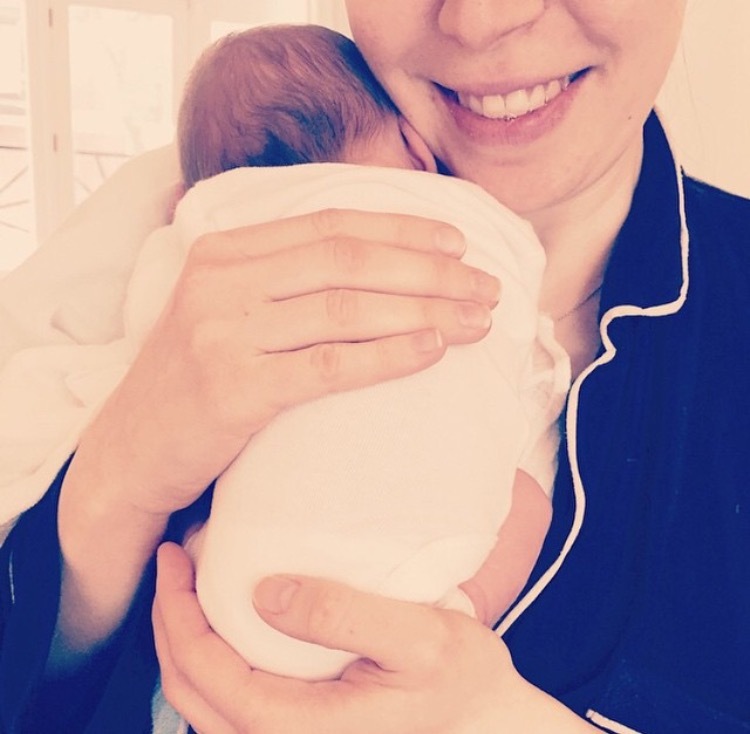 When I was pregnant, Robert and I often joked that I was excited about having a baby because it meant that I’d have an excuse to not leave the house for a while. As a total homebody I felt that I wouldn’t have a problem being at home all the time and was even looking forward to it. So I’ve been really shocked that I eagerly seek opportunities to get out of the house at least once a day. I don’t think it has anything to do with going stir crazy. I think it has more to do with finding an activity to break up the repetition of diaper changes, feeding, and napping that make up most days. Of course, connecting with others helps keep me sane, too : ) I think I also like the challenge of figuring out how to time and execute our little outings while Miles is asleep. I’m much braver than I ever imagined I would be! So whether it’s meeting up with other new moms, running an errand, getting a pedicure (yep, I did that at 2.5 weeks! ), or going on a long walk, I try to have at least one outing per day. I’ve also learned that if I don’t shower, brush my teeth, or get dressed early in the day then it likely won’t happen at all. So as soon as I’m done feeding Miles in the morning, I put him in the Rock N’ Play in the bathroom while I take a shower. Accomplishing these tasks increases the likelihood that we’ll make it out of the house at some point. And let’s be real—there’s no hair drying or makeup applying and I live in yoga pants just like I always have. 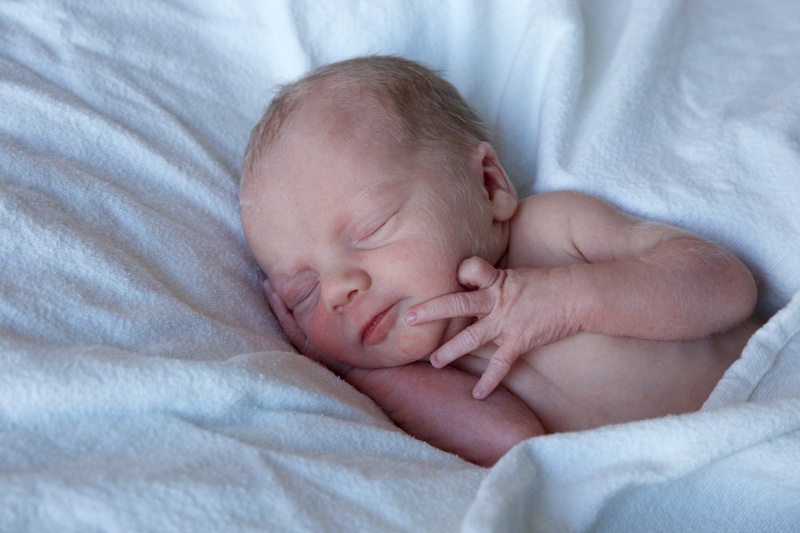 Your baby sleeps more heavily during the day and more lightly at night, as most newborns do. At night, make sure he’s fully asleep before putting him down otherwise he’ll cry and you’ll have to start over. There will come a time when you’re able to put him down sleepy, but awake and he can learn to soothe himself to sleep. That time isn’t now. All of those things people said about how your heart will swell with more love than you ever thought possible watching your husband become a dad? Spot on. Your baby is hard to burp. Try this: Put him over your shoulder (thanks for the tip, Leah! ), turn on some music, and dance around. It’s fun, effective, and drastically reduces gas-related fussiness. Accept help in every form. While you hadn’t planned for your parents to come out the first week after Miles was born (because you thought you could do it all yourself—ha!) it will turn out to be the best thing ever. They’ll get your house and your life organized, cook delicious meals, and stock your refrigerator with things you’ll live off of for the first month. 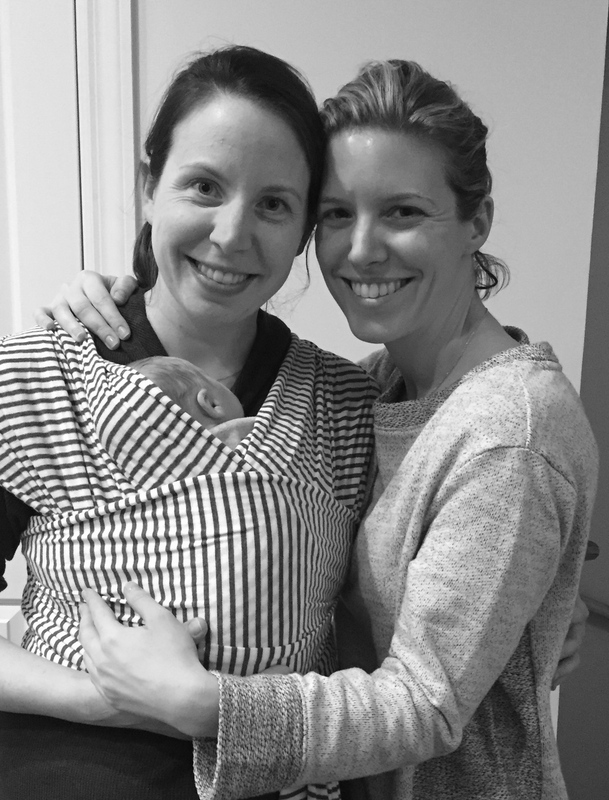 Then, when Miles is three weeks old, your sister will visit and help you in even more ways–from organizing your closet, to navigating Whole Foods with Miles for the first time, to cooking even more meals. Your family will help you in ways you never expected you’d need help and saying “thank you” will never, ever feel like enough. Your heart will also break over the fact that you don’t live closer to them. Any time Miles falls asleep, eat something. If you save eating for last, he’ll wake up just as you take your first bite. It never fails. Buy a big package of notepads (like these) and leave them all over the house with pens. Whenever something pops into your head such as a To Do, grocery-list item, etc. write it down. Mommy brain is real. 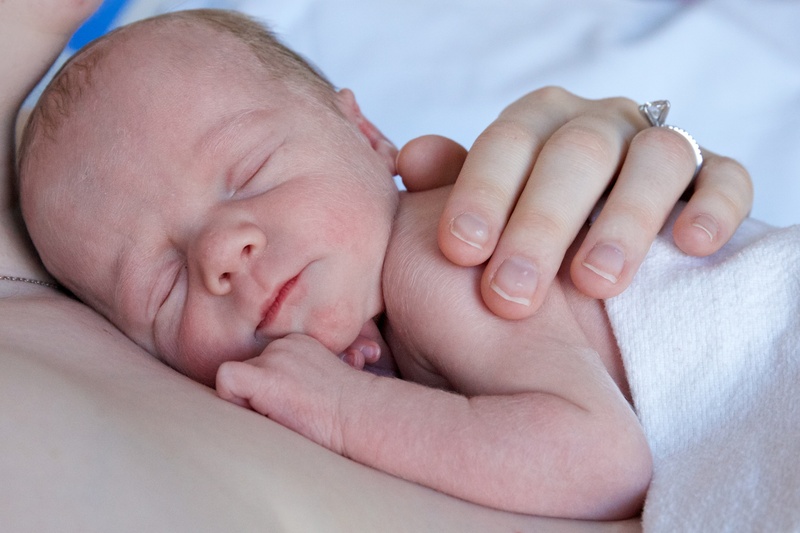 Some time around week two you’ll have a big breakdown because you’re trying to do way too much during the day and feel like you’re missing out on all of your baby’s newbornness. Here’s how to cope without having your house become a disaster: Choose at least one (but ideally more) of his naps per day that you spend with him lying on your chest and try to nap, too. You can do stuff during the other naps, but make at least one per day all about you and your baby. The Internet and Amazon.com will still exist after your baby is born and you’ll find time to use it. You don’t have to buy everything you think you might need before he’s here. This will result in countless trips to the UPS store to return a gazillion useless items. Wait until you actually need something before buying it. You’ll make it through the two days it takes for it to arrive at your door. You’ll be amazed at the outpouring of love, support, and advice from other new moms—some you know well and some you haven’t spoken to in years or even decades. Facebook truly is the 21st century village. Embrace it. Reach out to them when you need to and hope that someday you’ll have the opportunity to pay it forward. This entry was posted in Miles Atlas on March 27, 2015 by Paige Greenfield. Robert and I are some of the biggest planners you’ll ever meet, so it’s surprising that except for the fact that I knew I wanted an epidural, we adopted the no-plan plan when it came to our baby’s birth. I’m so grateful that’s what we did because it enabled us to embrace the process as it unfolded in a very unexpected way. At my 36-week doctors appointment, my belly hadn’t grown since two weeks prior so my doctor ordered an ultrasound to check our baby’s growth. It showed that he was small, but everything appeared healthy. With a month left before my due date, he still had plenty of time to grow. She explained that although there was no apparent reason why he wasn’t growing, it would be safest to deliver him as soon as possible. The moment she mentioned the risk of stillbirth the longer he stayed in there without growing, I knew it was what we had to do. In fact, she strongly urged me to head to the hospital right then and there to begin an induction. I still can’t believe I was so determined, but in my state of shock I pleaded with her to let me run home, grab our bags (or, in my case, pack my bag…oops), and drop the dogs off at boarding. Robert was working at a client about an hour outside of the city that day and it was snowing pretty heavily. I feared that by the time he got home, accomplished those tasks, and arrived at the hospital, I may have already begun the induction process. I didn’t want to go through a moment of it without him so I insisted she let me go. The drive home is still a blur. I called Robert at work and told him to head to the hospital because we were having a baby (!!!) I called my parents and my sister. I then started calling editors because I had interviews scheduled that afternoon that I needed to cancel or have them cover. I arrived home, sent e-mails to more editors letting them know what was happening and that I wouldn’t be able to finish various assignments. I blew through our house like a tornado grabbing clothes, toiletries, and snacks. I packed up the dogs and their stuff. I dropped the pups off at boarding and headed to the hospital while shoving a banana and two granola bars in my mouth. So much for that burrito bowl. By the time I arrived at the hospital, Robert had already started checking me in. We unpacked the car, waited briefly in triage, and were then on to Labor & Delivery. There, we waited in a waiting room for an hour or more while they prepped a room for us. Robert and I discussed names some more (we hadn’t fully committed to one just yet), and I chugged as much coconut water as I could. I’m sure we said “We’re having a baby!” and “Can you believe we’re having a baby! ?” a few hundred times. Finally, we were admitted to the room where our baby would enter the world early the following morning. As far as induction goes, it’s an extremely slow process. 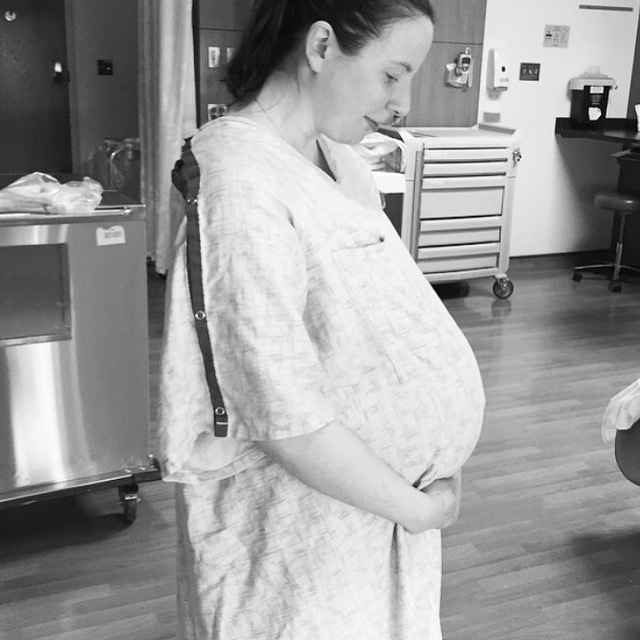 Without going into too many details, the rough chain of events went something like this: By Thursday evening I started the CRIB procedure in which a balloon-like device begins to dilate the cervix. At first it was bearable. Robert sat at my bedside, we talked a lot, he ate the leftover quiche he’d brought to work for lunch, and I snuck some Saltines and an applesauce muffin (I was supposed to be on clear fluids only). Then the contractions started. They offered to give me a medication through my IV to help relieve the pain. At first I declined, but eventually they became too much to bear especially since I knew that I still had hours to go with the CRIB even before moving on to the next step (pitocin). It was a great decision. The medication made me drowsy so Robert and I got an hour or more of much needed shut-eye before it wore off. 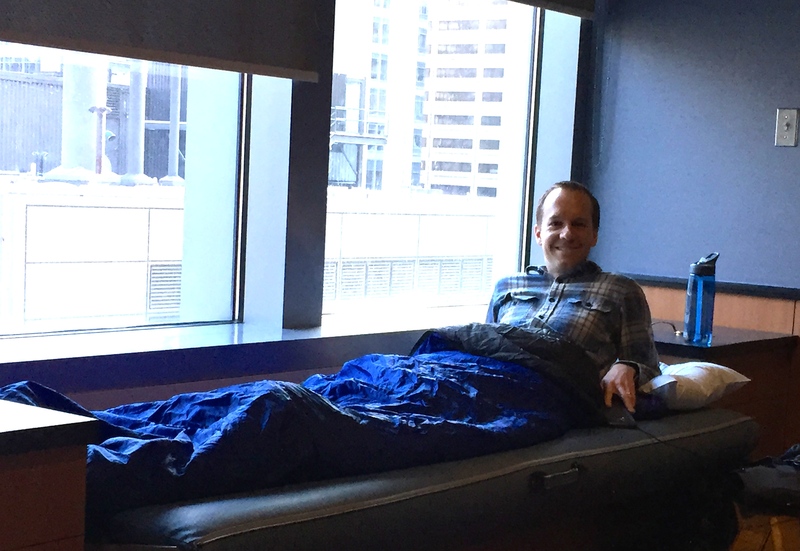 Robert made a genius move and brought a sleeping bag to the hospital. Everyone who walked into our room throughout our hospital stay was impressed–they’d never seen anyone do that before. After six hours, if the CRIB didn’t work they were going to leave it in for another six. I was sure I’d need six more, but, fortunately, the first six did the trick. By about 10:30 or 11pm I was 4cm dilated so it was on to the pitocin. After a while a nurse came in to break my bag of waters. However, her attempts were way too painful so she suggested I get the epidural and she’d come back to do it after that was working. As anyone who’s had an epidural knows, it can take a while from when you request it to when you receive it, which was the case for me. Thirty to 45 minutes later, through a series of painful contractions (people say they’re worse with pitocin, but I have nothing to compare it to), the anesthesiologist arrived. As far as the epidural goes, I’d say it was uncomfortable, but completely bearable and totally worth it for me. It took about 30 minutes to administer the epidural. As we moved from one step of the induction process to another, my body shook uncontrollably. I’ve never experienced anything like that in my life. It happened even before the epidural so I can’t attribute it to that. I’m pretty sure that it was fear overtaking my body. Going through labor for the first time (or maybe every time is like this?) is terrifying. There’s no doubt about it. It’s especially so when one moment you’re contemplating what to eat for lunch and the next you’re being told that you’re about to have a baby two weeks before his due date (when you were sure you’d go past your due date). I didn’t know what anything would feel like or whether any complications would occur. 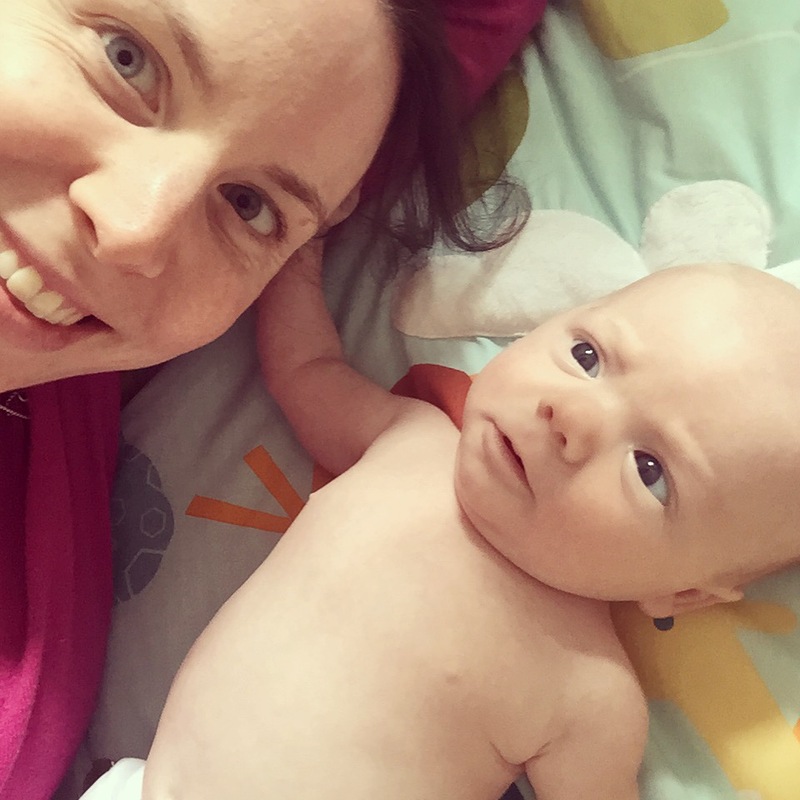 And, due to how urgently my doctor wanted me to be induced, I often felt more fear about our baby’s wellbeing than about what I was experiencing. I just wanted to deliver him and find out if he was okay. While shaking, I did my absolute best to soothe myself with deep breaths. Robert was at my bedside every step of the way holding my hand, reminding me to breathe, and providing endless reassurance. I always knew he’d be amazing when this day arrived, but the reality was so much better. Once the epidural was in and started working, the nurse came back and broke my water. From that point, the nurse explained it could take many hours to dilate from 4cm to 10cm. Neither Robert nor I kept track of time during the labor process (we were a little preoccupied…), but I kept reaching the next step much faster than anyone anticipated. In the early morning hours on February 27, I told the nurse that I felt like I needed to push. She couldn’t believe it, but when two different people checked they agreed it was time. The only problem? Since they figured it would take many more hours before I’d be ready, my doctor was still at home, more than 30 minutes away!!! The wait was excruciating. Not only is it the oddest feeling to want to push and not be able to, but I’d misunderstood the anesthesiologist’s instructions on how to use the bolus to administer more of the medication. For a while, the pain got away before the medication could catch up. Robert was there holding my hand as I breathed deeply through each contraction. Which, thankfully, I was able to do shortly after the doctor arrived. Speaking of the doctor, I go to a medical practice that has about six OB’s on staff. Whoever is on call when you’re in labor is the one who delivers your baby. I’d met all of them prior to that day—except the one who delivered Miles. In fact, I had an appointment scheduled for the following Tuesday to finally meet her. As luck would have it, she couldn’t have been more wonderful. Now, I can’t imagine anyone else delivering our baby but her. Between contractions, one of the most helpful things I did was to ask the doctor where the baby was within the birth canal and what exactly I was trying to achieve with the next series of pushes. She explained it all so clearly so that from then on, at each contraction, I was able to visualize what was happening. Not only did this help me make the most of each contraction, it gave me something to focus on beyond the fear and immense pressure I experienced. This is again where I felt my yoga practice made a huge difference thanks to the mind-body connection I’ve developed over time. When I could visualize in my mind what I was trying to do, my body was able to carry it out. The doctor explained that most first time moms push for two or three hours before baby is born so I braced myself for the long haul. But the contractions came fast and furious. 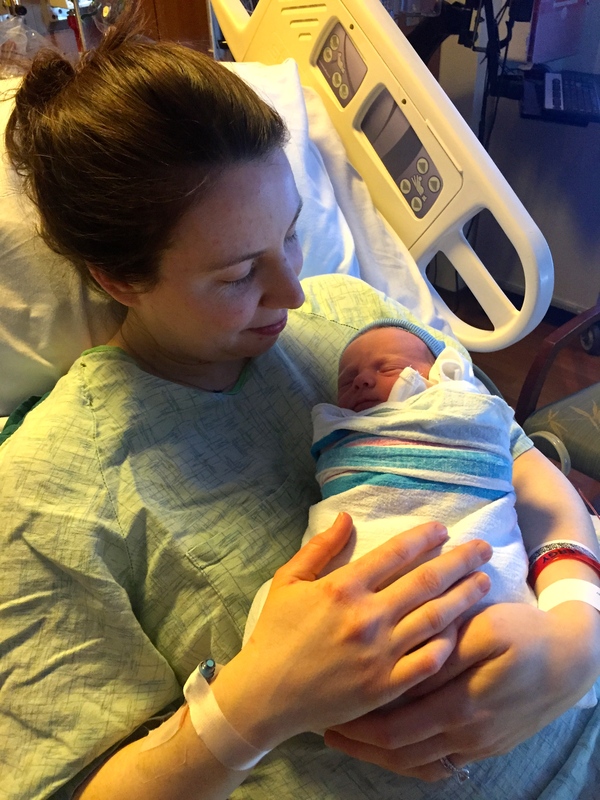 A little more than 20 minutes after I started pushing, at 5:39 a.m.on February 27, baby Miles was born. I think that every parent hopes they’ll hear those cries as soon as baby is born and I’m so grateful that that’s exactly what we experienced. I’ll never forget that moment for as long as I live. I immediately dissolved into a flood of tears, crying just as hard as our newborn son. I’m still weepy every time I think about the moment he was born (like right now…) It was the greatest sense of joy and relief I’ve ever experienced in my life. While I’d hoped they’d be able to lay him on my chest right away for some skin-to-skin, the nurses had to take him to the warmer first so they could make sure he was okay, given his tiny size. And tiny he was: Miles weighed just 4 lbs 13 oz at birth. And, like most babies, he’s lost weight since then–bottoming out at 4 lbs 6 oz. He was almost back to his birthweight at our one week doctors appointment and he’ll get checked again this Friday, at two weeks old, which is also his actual due date. 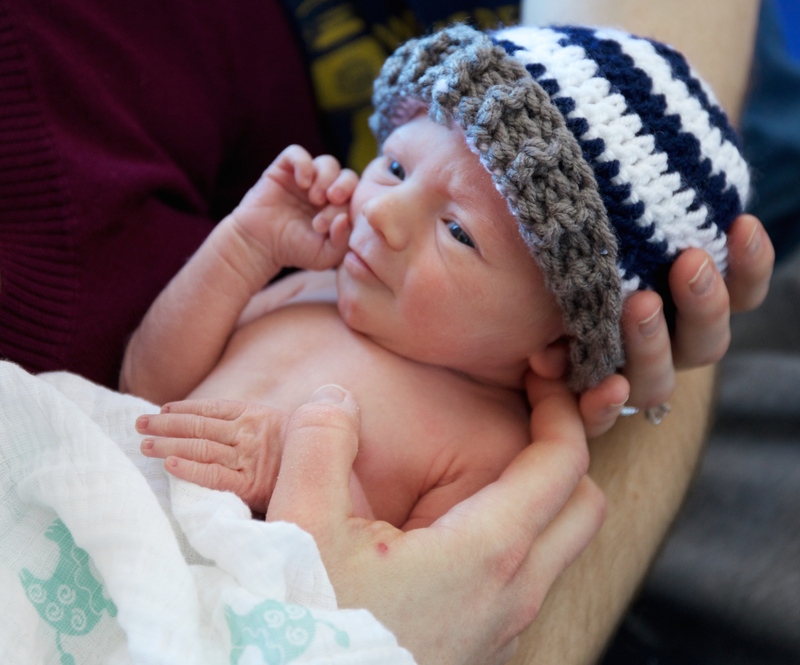 Thankfully, he was completely healthy and continued to pass every test for both full-term and small for gestational age (SGA) newborns with flying colors throughout our hospital stay. Robert cut the umbilical cord, the nurses cleaned our baby off, confirmed that he was okay, and moments later they laid him on my chest for the first time. During labor, we’d settled on his name, Miles Atlas, and I’ll never forget the first time after he was born that I uttered it out loud. Miles Atlas, our son, was finally here! It’s entirely impossible to capture in words what it felt like to hold him for the first time, except to say that it was the purest sense of love I’ve ever known. We may never know what stopped him from growing during my pregnancy. It falls under the category of intrauterine growth restriction (IUGR), but that may be due to countless factors or for no reason at all. The best the doctor could say is that for one reason or another, my placenta may have stopped working. They sent it to pathology, but told me the results are often inconclusive. I’m just grateful that I was able to carry Miles to full-term and he entered the world as safe and as healthy as could be. 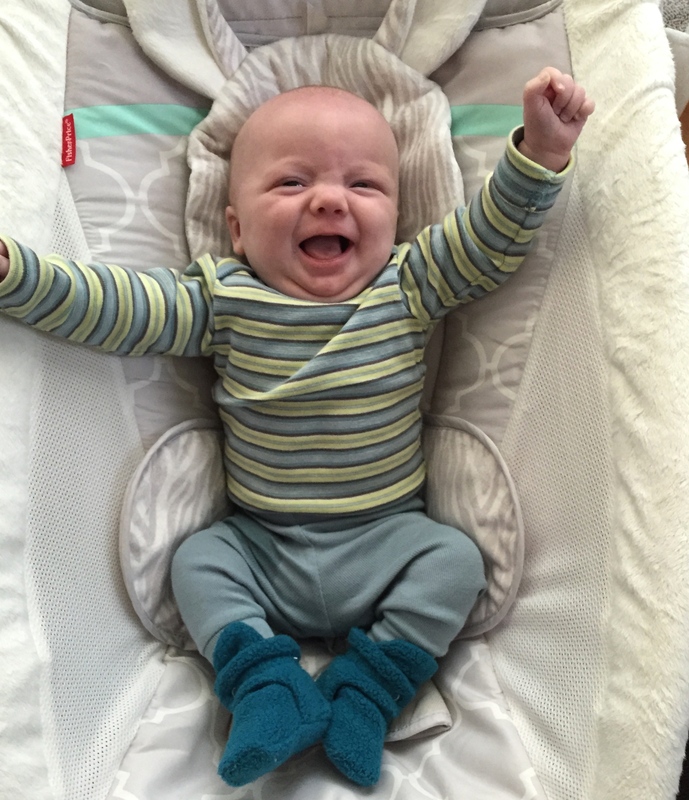 My dad has already nicknamed him TBM–Tiny but Mighty–and that’s exactly what he is. Our hospital stay couldn’t have been more wonderful. I’m healing really well, Miles is doing great and I couldn’t dream of a better husband or father than Robert. There’s no other way to describe how I feel right now, even through the sleepless nights, new mom doubts, feeding challenges (it’s so hard, but we’re working at it) and fussy moments–than peaceful. It feels like Miles was always supposed to be ours and caring for him is already the greatest joy I’ve ever known. Thank you so much for joining us on this incredible journey! This entry was posted in Miles Atlas, Pregnancy & Baby on March 9, 2015 by Paige Greenfield.